Below is the transcript of a conversation regarding this issue I had with three scholars, all of whom have studied the interaction of police and the African American community. RASHAWN RAY, Department of Sociology, University of Maryland. DON TOMASKOVIC-DEVEY, Department of Sociology, University of Massachusetts-Amherst. Todd: What do you think about the logic that Blacks commit more violent crimes therefore they are more likely to be killed by police? Don: If you start at the level of interaction, when a policeman shoots a citizen three things have to happen. 1.The officer and the citizen have to have contact. 2. Within that interaction there has to be something that generate the feeling of threat or aggression in the officer. 3. The officer has to actually resort to a violent response. So it does seem to me that from a social science point of view that we should be thinking about this as an interaction, not a reflection of individual traits. The ideas we hear from the Right that officers respond to dangerous people or from the BLM and the rest of society that officers behave in racially biased ways both miss this interactional complexity. We do know that the level of violence in particular in African American communities is higher than the national average. Are police shootings tied to the actual threat to police or the level of violence in the community? In research I am doing now on police killings it looks like the general level of police-citizen killings does go up when police are assaulted more often, but not with the overall violent crime rate. Black killings, on the other hand go down with more police assaults and up with the level of violent crime. These estimates use state-level data, which is far from appropriate and should be taken as preliminary at best. But we should be pursuing these types of questions in addition to establishing the baseline racial disparity in police-citizen killings. Back when we were working on this in the 2000s around “driving while Black” issues, we did a lot of work to try and figure out baselines about the probability of an officer encountering a Black driver. And then we also asked questions about if there were race differences in driving behavior. Now it worked a bit different for driving because typically Black drivers were driving at a rate lower than their frequency in the population, there were fewer Black drivers with driver’s licenses and they drove fewer miles per year than the average White person and they drove more carefully than White drivers. So adjusting for those things increased the potential for racial bias. Todd: But the Black Lives Matter movement is mobilizing around instances of unarmed suspects being shot and killed and often what I see thrown out there as justification for this are the violent crime statistics. We need to distinguish different types of crimes. A lot of the police shooting victims are just being stopped for traffic violations or some other petty, non-violent, offense. So if we are focusing in on unarmed deaths, the first question is why should ANY of them happen? Why should there be ANY unarmed deaths of African Americans, White, Hispanic…anyone? To me that points to a fundamental failure of police training and policing. When we see the videos of these events, what I am seeing is police behaving, seemingly irrationally, … I see two kinds of behaviors, a really gigantic fear response form the police officers involved or a kind of testosterone response where they are exerting their dominance and because it is not being respected and they lash out in one way or another. In that sense, it should never happen. In other high income countries, this never happens. This is a US phenomenon. On the other hand, is that police officer having that fear response because he or she is in a high crime neighborhood or they feel that they are? Because they fear all black men? Both are probably often the case. I recently read a new paper in the DuBois Review by Robert Durán. It looks at how police shootings are legitimated by DAs and challenged by citizens in Denver over 30 years. 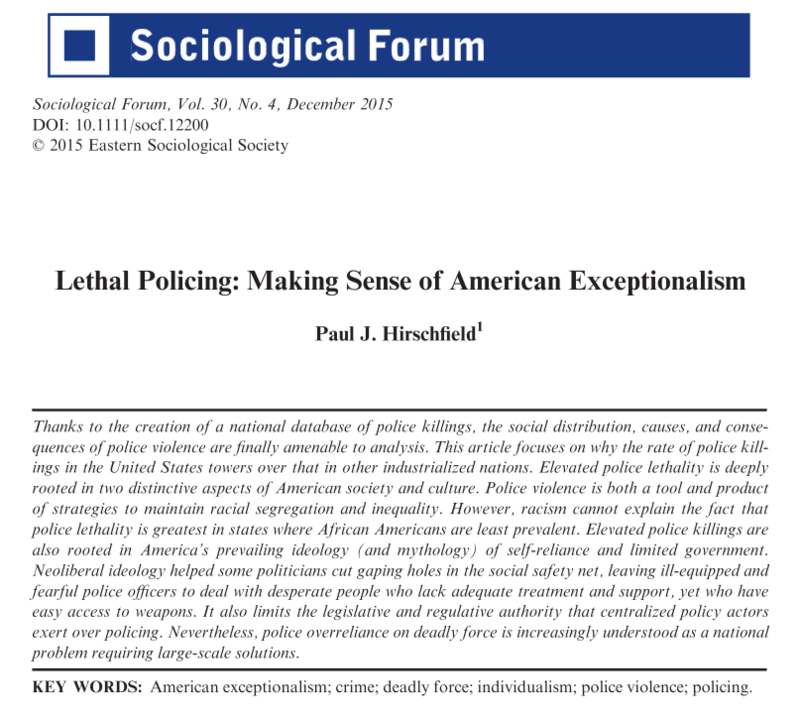 The substantive focus is important in its own right, but the paper includes a useful review of the law on police use of deadly force, which under English common law has been sanctioned since before there was a U.S. Importantly, the law on justified police-citizen use of force varies across states and many U.S. states have a very low bar – fleeing, committing a crime. In many state’s shooting someone committing a felony or fleeing from police is legal. It was not until 1985 in Tennessee v. Garner that the U.S. Supreme Court ruled that police could not shoot a fleeing suspect unless the officer believed the suspect posed serious risk of death or injury to the community. Durán’s lit review suggests this decision may have had little effect on police behavior. All of which is to say that there probably are some police training variation in what forms of police killings are legal or even expected of officers. Todd: Cody, your work does control for at least some of the crime rates at the county level. The assault crimes and weapons crimes by Whites and Blacks. I looked at the ratio of Black crime to White crime, using that to predict the Black to White shooting ratio by police and there is no effect at the country level. Now it could be that at some level below the county, like the police precinct, zip code, or something smaller, there may be significant relationships, but counties that have higher Black to White crimes rates do not have higher Black to White police shooting rates of unarmed people. So this makes me a little bit suspicious of the crime story. I think what might be being picked up on by the model (since the population size effect is pretty big and the inequality effect is pretty big) is that the black to white shooting rate ratio by police might be highest in large, highly unequal metropolitan counties which have specialized police units. Some recent work has suggested that specialized forces, like gang units, are likely to be the most egregious in terms of shooting unarmed Black people relative to unarmed White people. The reason this might occur is that if you have a department that is specifically targeted at individuals of a given racial or ethnic group that tend to be armed or involved in crime, then the police in that unit are going to be learning about the covariance of race/ethnicity and armed/criminal status from a very small, very biased sample of the population. In wider community contexts, police in these units are likely to falsely impute the probability of a suspect of a given race or ethnicity being armed in a way that is very strongly biased in regards to expecting a weapon. Under this model, it is not really the true relative levels of crime or armed status that should be related to bias in the police shooting rate, but rather what police expect the rate of armed status to be based on how they have learned. With regards to the possible effectiveness of police training in removing racial bias, I think that this is going to depend on the police department. In many police departments, there is basically no significant evidence of any racial bias. In some departments, training may be all that is needed to attenuate unconscious implicit bias that can lead to a higher Black to White ratio of police shootings. In other departments (probably only a handful), there might just be explicitly racist officers or sociopaths that simply enjoy exerting social dominance and inflicting physical and psychological pain on other people. Most officers are not like this, of course, but some probably are, and these are the most problematic cases. We have got to ensure that there is zero tolerance for people like this on the police force. Over the last few years, there have been many examples of police being caught messaging explicitly racist things, for example in San Francisco. So I think we need to focus on trying to identify both the large scale structural issues that lead to moderate levels of racial bias across the board in police shootings, and the specific departments and officers that are the most problematic. I think it is also important not to use blanket statements about police-in-general, as this triggers a lot of reactionary in-group out-group identity conflicts that don’t really help anyone; strategically, it might as important to highlight the good work being done by some police as it is to highlight the problematic cases of some police sending racist vitriol. Todd: We saw some of this in Ferguson as racist emails between police officers and the city court clerk, which were revealed after the shooting of Michael Brown. The problem with this type of logic is that we assume that an entire group of people is responsible for the actions of some and that the entire group should be criminalized for it. So in other words, because of the perception that Blacks commit more crimes this somehow justifies the fact that Black people are actually policed more. The problem is that this shouldn’t be the case. First, an overwhelming percentage of Blacks are not criminals and those that have been convicted of crimes, studies show that roughly 75% of Blacks in prison are in prison for nonviolent drug offenses. The other narrative is that Black neighborhoods are ubiquitously framed as being problematic and crime prone when in fact there are a plethora of predominantly Black neighborhoods around the country, one of which I happen to live in, that has extremely low crime rates and are not part of the narrative. On the other end of the spectrum, there are predominantly White neighborhoods that have high crime rates, but for some reason we leave these two types of neighborhoods out of the narrative as it relates to crime. So what is happening is that an entire group of people who overwhelmingly are not committing crime and are not guilty, end up being criminalized because of the logic that people have about this. I will give a couple of quick examples here. First is the logic that if a person is stopped for a crime or suspected of committing a crime they are probably guilty. Actually this is not the case, there was a study done in New York City using Stop-and-Frisk data. This study actually resulted in Stop-and-Frisk being ruled unconstitutional by the New York Supreme Court, and what they found was that African Americans were more likely to be stopped by the police, they were also more likely to be roughed up by the police, to be frisked, physically assaulted by the police, but they were significantly less likely to have contraband on their person or actually be committing a crime at that particular time. So you had about 9 out of 10 of the Black men that were being stopped were not doing anything wrong. What is interesting to me, knowing the way that police operate personally and then also looking at the data, is that there are a lot of these points in time when the police interact with citizens that is never captured in the data. Another point I would like to make here is that Philando Castile who was recently killed in St. Paul, Minnesota was stopped 50 times over the past fourteen years or so. The logic is that if you are stopped that much you obviously have to be committing some sort of crime. This is what is interesting about Philando Castile. He had never been convicted of violent crime, he was a legal gun owner, and according to the other employees and the children of the school where he worked he was a model employee, and he took classes learning how to deal with the police. This speaks to the fact that as much as we value politics of respectability in the Black community, they do not necessarily prevent people from being harmed by the police. So in many respects this is about Blackness being seen as guilty before due processes. The logic is that if the cops didn’t catch a Black person doing something today, they probably will one day, so who cares if this is happening today. The logic is that in being killed, if you are a Black person, is simply collateral damage. This is highly problematic. Todd: There was an interview with Philando Castile’s mother who thought he was targeted because of the older model cars he drove that resulted in police stereotyping him as a pimp or drug dealer. Rashawn: What is interesting about that, new, really nice luxury cars get Black men pulled over too. While I can see some sort of analysis that if someone was driving a Cutlass or something else, but in many police departments around the country they still drive older sedans as their police cars. I think that this is more about, regardless of the vehicle the person is driving, similar to the type of attire the person has on, a person’s Black skin is the schema that we use to actually evaluate whether a person should be criminalized. Don: I think this is something we all have to agree on and that if we are at the same time trying to figure out how do we intervene we are probably not going to intervene at the level of national culture around Black skin. What I keep thinking is that we need to get closer to what police are actually doing. Rashawn is focused there on routine police harassment of African Americans and African American men in particular. Obviously, if you increase the contact level, then you have routine policing which is aggressive at its base and then it interacts with race and neighborhood which generates a fear response in the police then it all conspires to lead to violence of one sort or another. On top of this baseline process there are no doubt particularly racist or aggressive cops and police organization and local variation in expected and or legal use of force. Clearly the shootings and killings are the most egregious outcome of this racialized and violent policing practice. While the unarmed killings are the least defensible, my gut feelings is that they are generated by the same mechanisms producing other police-citizen violence. I suspect that most often that the causal mechanisms underneath police violence is organizationally based routine police training and deployment and the way they are treating citizens, including and especially Black citizens. So if we want to intervene we need to intervene at the organizational level to change police practices. Firing particularly racist police officers might help as well. Todd: What is the ideal data set? Don: I think it is too complex for an ideal data set. I had one idea today though. The Black Lives Matter movement is holding marches and vigils in many, many cities and in some of those they’re being harassed and corralled by the cops and in some they are getting some kind of cooperation. It would be totally interesting to know what is that variation across police forces in their response to the movement? Now that is not exactly the same thing as whether the level of violence if going to go up or down and unfortunately our data are so terrible that we won’t know that for years, but my feeling is that the ideal data go to the level of the police forces, the real ideal level, because of this issue of bigoted offices, is if you could have data on officers nested in their police forces where you also know characteristics of the community. Cody’s example about the gang units is instructive. When we were doing the “Driving while Black” study in North Carolina, we had complete access to the data from the highway patrol on something like 1500 officers and we had really good control variables and we identified 12 officers who were stopping African Americans at higher rates than they should have been. We found no race bias in routine traffic stops for the other 1488 officers. On the other hand, there was a single unit that was dedicated to searches that was doing a gigantic amount of searches of African Americans, and exactly like Rashawn said and many studies have found, whenever you’ve got profiling practices, you end up finding less contraband on the profiled group and of course much more social destructive relationships with the community get generated. So I think the local context stuff is pretty important. Don: I totally disagree with you Rashawn. What I hear there is explicit bias. He is using wide nose as a code. Rashawn: I completely agree, but the narrative that we hear though is that he didn’t mean anything by that. Part of it is getting people to realize that, no that is not okay to say, that it is indeed racist but the narrative we have is, “That’s not a big deal. That’s not being racist.” So part of it is highlighting the ways that racism is operating in implicit and explicit ways. Part of the reason I am saying it is implicit is because of the narrative that we have about race is that it is so individualized that we assume that you have to specifically be doing something to someone in terms of treatment and calling someone a specific derogatory name to be engaging in racism. So we really have to be more nuanced and I think we are definitely agreeing on that point. I think part of what might get at differences between police departments is… so working with the Prince George’s Police Department, my colleague Dr. Kris Marsh and I have been doing implicit bias and racism training with the police department here in the county and what we noticed, sitting in meetings with them, is that the difference between going for numbers, quantity versus quality. These are two very different things. There are some police departments, say like New York City, that are all about quantity. How many stops can they get? Ferguson, MO was all about quantity as well. How many traffic citations can we send out because we are trying to fund our government? That is very different than going for quality. When you go for quality potentially you start going for other indicators besides a person’s skin tone. I think that is probably the reason why Whites, in the New York City study, were more likely to be found with something on them or committing a crime because the police officers were looking for other indicators besides their race that might actually suggest some type of criminality. I think those are the two things… we need the transcripts, which we don’t normally get. We need to code those. And we need to know the specific polices. We need to know the approach that police precincts use to actually go out and stop people. In other words, are they posted up doing DUI stops and speed checks and if so where do they do these speed checks? Are they more likely to do them in predominantly Black neighborhoods? So if you are doing a DUI check in predominantly Black neighborhoods, even though Blacks are less likely to use drugs than Whites, then you are going to find more Blacks with drugs and you are going to end up convicting more Blacks. These are the types of nuanced forms of data that I think we need. Don: I agree and one of the things that I think is particularly useful there, particularly at the police level, is the practices acts of police violence are this nested in, first the number of contacts, then there is the number of profiling bases contacts, then there is general aggression and violence on the street by police, then there are shots fired and then there are killed people. In my mind, I agree with Rashawn here that these things are all linked in not just simple demographic ways, you have to have one to have the other, but also linked in that you get negative feedback loops from relationships with the community and in police officer perceptions of the community. That is, you are probably generating more racist cops than you hired once you create these profiling/harassment practices and then of course you generate a community that totally distrusts the police. Tremaine McMillian was put in a choke hold on the beach in Miami with his puppy for giving the police a “dehumanizing stare.” The shootings and the killings are the rare events that confirm our worst nightmares about the police and of course make the police the most defensive of their practices. Cody: The ideal dataset… it would be great to have geographically-resolved data on encounters between civilians and police as a function of race and other demographic characteristics; we saw a little bit of this in the Fryer study that came out recently. How we look at that data is really important though. A follow-up paper that I am working on now shows that a consistent racial bias against Black people generates all patterns that Fryer finds including the inverse relationship between encounters and being a victim of a police shooting among black people. Heterogeneity in how often police encounter people as a function of race can lead to some paradoxical outcomes in simple regression models that don’t account for the full dynamics of the system. We also need more data on individual officers. 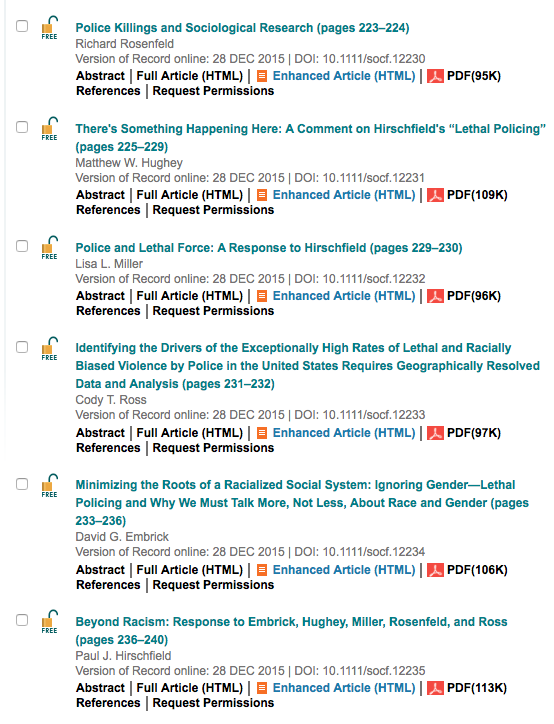 I think there are a lot of positive things to be gained from completing the US Police Shootings Database that I looked at in my PLOS article, because we can extract a lot of really decent information from news articles. This is something that anyone can take part in doing and the more people we have coding each instance, the more credible the overall dataset will be. Don: Some of it will happen from crowd sourcing, from doing scrapping every morning of yesterday’s events and I know that is going on all over the place right now. Some of this data has already been collected by police departments and not released to the public or analyzed by the police departments. That is one of the things that came out of the “Driving While Black” politics which is that many police departments collect contact data and then it just sits there and it is not analyzed by anybody. The last thing I would add is I would really love to find a way of measuring the frequency of truly racist attitudes, not just implicit bias. As discussed a few moments ago, we have seen officers in the San Francisco police department or in Ferguson get caught sending racists texts and emails. How prevalent are these kinds of attitudes among police in general? Are some departments hot-spots of these attitudes? Or are there just a handful of randomly distributed problematic officers? I like Don’s idea of looking at police responses to Black Lives Matter events in various communities. It would be interesting to see how those data relate to racial bias in shootings, because that might be an indicator of explicit bias. Would it be feasible to crowdsource data in other ways? If anyone has ideas on how to do this, I would love to hear them. Don: I think some of this could be discoverable through the data that we might have already. You wouldn’t have the implicit or explicit measure of racism if you have data on officer violence and the race of the citizen, and race of routine contacts, you can generate an officer level distribution. If the generative mechanisms implicit bias, a pretty weak causal mechanism, most officers would have low levels of violence that were closely ties to events. Killings and unarmed killings might happen, but it would be almost random, not correlated with other acts of police violence at the officer level. Deployment is a strong mechanism and we should see police violence concentrated in black neighborhoods. Explicit racism it is a strong mechanism and should produce a totally different distribution of the dependent variable, with some officers with extreme patterns. If a police force was particularly racist in its officers and/practices it should have more extreme distributions than other police forces. In Cody’s paper, it is Miami-Dade county that racial disparity is something like 23 times higher than the baseline probability. New Orleans and L.A. were also outliers in the distribution. The point is that if all we have is data on the dependent variable, police violence, we still may be able to logically identify the causal mechanism from the shape or location or the race of the distribution. We wrote a theory paper on this during the Driving While Black politics that might be of some use today. Rashawn: That point Don is making is extremely important. I have a paper that will hopefully be coming out over the next several months, you know how slow peer review can be, but this paper is basically looking at the reasons why middle class Blacks are less likely to engage in physical activity in certain neighborhoods and what I find is that in predominantly white neighborhoods, Black men are less likely to engage in physical activity where in predominantly Black neighborhoods, Black women are less likely to engage in physical activity. The argument that I make in the paper is that on the one hand this has to do with criminalization in predominantly White spaces, but in predominantly Black it is a different mechanism. In Black spaces, this might become a case where it becomes more about the quantity for police officers. They know they can set up certain stops and it doesn’t necessarily matter how many people they stop, how many people they actually stop and frisk, the question is, do they eventually get someone? I think that is the key mechanism that is highly problematic. It seems that police departments are not worried about quality, they are simply worried about quantity. The problem I have is that while we focus on police killings, and rightfully so, there are thousands of people who come into contact with police officers in a given time period and have very negative interactions with police and these sort of interactions are never recorded. In fact, if we think about shootings, 75% of people who are shot actually survive. So there are a lot of people going around who have been shot by police officers. Dr. Joseph Richardson who is a professor of African American Studies here at Maryland, he has a study of the Prince George’s county hospital and his study is “Who Shot Ya?” and what he is trying to do is get a question that ER staff ask of individuals when they come in. Most people know who shot them or they think they have a good idea of who shot them. What happens is that if that question is not asked initially then it gets suppressed. Police officers come in and suppress things, individuals from the neighborhood who have shot someone else comes in and tries to suppress things and so I think there are a lot of different variables that we can bring to bear and add in. Dr. Keon Gilbert and I had a paper come out earlier this year in the Journal of Urban Health called “Why Police Kill Black Males with Impunity.” I heard that word used earlier in the conversation by Cody and I think this is something that becomes extremely important as well. How quickly are people shot and killed? We also don’t have information on that. How much are things deescalated if a person is White compared to when they are Black? So these are very important variables that we need to collect. So, my point is that we just need a general database. It is not mandated at all that police departments have to even report police killings or police violent and physical encounters with citizens. Some politicians tried to push this legislation through the Senate and Congress, but it fell on deaf ears among Republicans. It is highly problematic that we can get data on how many people catch the flu each year, but we don’t have information on how often a police officer uses or thinks they need to use physical force on a citizen. Todd: So this comes back to the idea of the body camera data, because it seems like people, whether it is the police precinct or individual officers reporting data is often in error and biased toward the police officer’s view. Body cameras and transcriptions of interactions would be data that could be analyzed independently. A lot of people bring up the expense of getting every officer in the country a body cam, but we have spent the last decade or more transferring billions of dollars worth of military equipment to local departments, surely we have funds to get body cameras. The other thing I hear coming out of this conversation is that one, there are multiple levels here. There are individual officers that may be implicitly or explicitly racially biased in favor of Whites, and we have police units within departments, Cody you mentioned these gang units, and then we have whole police departments and their policies. Don you mentioned that some today regarding the police training and Rashawn you mentioned this idea of departmental policy of getting a lot of stops in minority neighborhoods and quantity versus quality of stops. Don: I think there are other mechanisms at play as well. This is why I think it is not about an ideal dataset but rather the triangulation of lots of data. One of the things is that standard police training for citizen control is around dominance in the interaction and standard police training around the use of violence is to protect the police officers’ life at all costs. For example, a very common thing that happens in police academies is that officers learn the 20 foot rule. If a citizen has a knife and is within 20 feet of you, they can get to you before you can get your gun out and shoot them. Now this not only generates fear in the police, but it gives them license to kill. Similarly, it appears that as long as a citizen has a gun they can be killed, even in an open-carry state with a license. At least if they’re Black. I think there is a lot to be said about that kind of routine training. My feeling is that the way this happens is that there is the racism that is in the culture, there is racism that is either in the police officer or in practices of particular police departments and all of these are racialized. Then it interacts with this training which actually gives them the license to kill. Todd: Well and the law right? Because the law says that it will back up any police officer’s use of deadly force when the officer says they felt threatened. Don: Exactly, but that is also an organizational product. I think it is a mistake to think of it as “the law” because it is particular District Attorneys and Police Chiefs who are backing those officers. Most of the time it doesn’t even get to the DA level because internal reviews justify, protect offending officers. But you do not need to prosecute police to address this problem. You could behave like Richmond, CA where a new police chief comes in changes the training on acceptable violence, fires the most violent officers, and police violence plummets. Another way to think about it is that if this was private sector corporate America the kinds of behaviors that police now get away with they just couldn’t get away with. Rashawn: Don is making great points. One of the things that Keon and I do in this “Why Police Kill Black Males with Impunity” article is we try to lay out what some steps are moving forward. Collecting and analyzing data is one of the main things. Thinking about body cams is something another one. Cody mentioned that it seems to be something about Black representation in a city and I think the way we need to think about that is governmental representation, whether that be the mayor, city council members, and even the percentage of police officers who are non-White (though Black and other minority cops can definitely embrace similar ideals about Black criminality), in addition to thinking about cities that have community review boards that are separate from what is happening at the government level. Instead, it is a community group that comes together to evaluate all violent interactions between police officers and citizens. We need to figure out if these are factors that potentially change some of the outcomes in the racial disparities that we see in police shootings. I think that something that we really need to focus on is that the rise in the police killings over the past couple of decades… criminologists will also say that it has a lot to do with the ways that “stand your ground” laws have taken off across the US. If we think about these laws which allow citizens… if they fear someone, that was one of the first things we heard mentioned in this conversation… if fear can be used as a defense then we are definitely moving in the wrong direction. People are trying to figure out, if crime is going down, if police officers being killed is going down, then why are police killings of citizens going up? Part of this has to do with the policy changes that were enacted in the late 1990s that has led to this increase. If an everyday citizen can take the law into their own hands when no one has done anything physically to them, imagine what we allow police officers to do. Todd: So, one addition to the ideal data set might be whether or not it is a “stand your ground” state? Don: One of the things that I worry about here, and it comes from my own personal guilt, from being part of the academics that were mobilized around the “Driving While Black” politics. One of the things that happened there is that in the end we wrote some really good peer reviewed papers that came out after the politics had exhausted themselves. Police and state legislatures produced a kind of legitimacy-creating device by collecting police-citizen contact data, which then were left unanalyzed. So in some sense the social scientists left it to the police to police themselves and that was a mistake. One of the things we have discovered through the Black Lives Matter movement is the real importance of collecting data ourselves and to relying on official statistics. The FBI does not collect data on police violence. It turns out that a British newspaper, The Guardian, collected starting in 2015 the best data we have so far on police-citizen killings in the U.S. Some academics are doing this now, most note-worthy is Chris Smith at UC-Davis. We have to make sure that continues and that it is not just a short-term academic response to politics. We can’t evaluate if things are getting better or worse now. The really fundamental questions –how do you stop this violent policing? Is racial disparity getting better or worse? Even what predicts police violence or racial disparity? All require long-term data collections. I do fear that the academics who are excited about this now may lose interest when the politics wane. When that happens it will be up to the FBI and local police to police themselves and that would be really a terrible shame. Donald Tomaskovic-Devey, Marcinda Mason and Matthew Zingraff, 2004. “Looking for the Driving While Black Phenomena: Conceptualizing Racial Bias Processes and their Associated Distributions.” Police Quarterly. 7:3-29. In a recent turn, the US federal government will require police departments to track and report deadly incidents involving officers. The reporting will be required quarterly. The data collection will be done by the Department of Justice’s Bureau of Justice Statistics. Prior to this, no national level data has been collected. 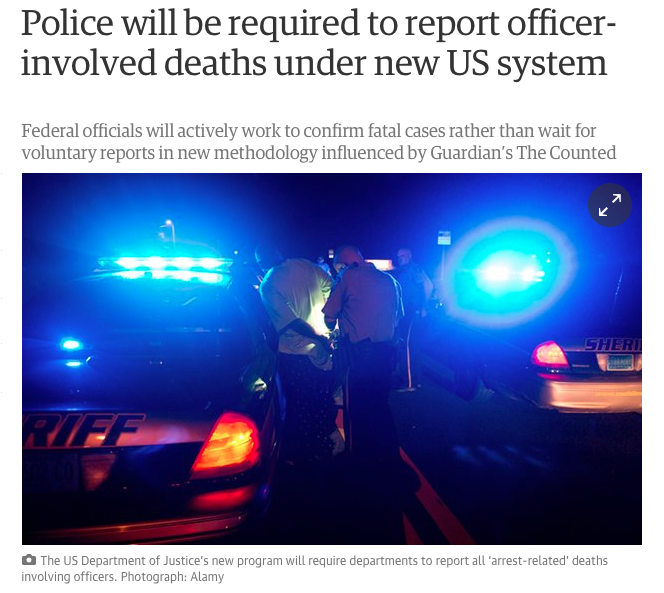 Starting at the beginning of 2015, The Guardian newspaper started scraping daily news reports and used reader reporting to keep track of the incidents where police used lethal force on citizens. See some analysis of the 2015 data in a previous post on this blog. Also see a classroom assignment for teaching Excel basics using the 2016 data up to August. Additionally, the Washington Post also started collecting data on police shootings in 2015 and the crowd-sourced web site, Killed By Police, has been collecting data since mid-2013. Additionally, Fatal Encounters, is trying to log all encounters where police used lethal force going back to 2000. It has some interesting mapping tools and visualizations of the data as well. Previous federally collected data from individual police departments, which are city, county or state level, was voluntarily reported, lacked consistent definitions of events, and did not contain any data on citizens killed by police. I hope I can add substance to this discussion. Firstly, a grip on the statistical facts is still needed. See Paul Hirschfield in Sociological Forum 2015, 30:4 and the commentaries in Sociological Forum 31:1. Statistical accuracy is a problem, and as I will argue later, so are assessments of police departments and communities/jurisdictions. Don Tomaskovic-Devey's first remark concerned interaction. I think that before we can look at interaction or contact, we need to address the organizational structure of police departments/jurisdictions. I suspect that we will find that there is no effort to establish any race/ethnicity/gender parity or balance with the jurisdiction in question or with police departments generally. This should be addressed under National and State statutes regarding discrimination in hiring, but first the actual facts need to be researched to determine the degree of balance. The ultimate question is whether a police force should be integrated and, if so, how hiring practices can be addressed. All jurisdictions do not require race 'balance,' but they should all be integrated. Police officers' backgrounds get little attention unless there is a critical incident. If there are substantial classes of officers with particular backgrounds, e.g. military experience (what kind), education, SES, prior training experiences, etc., are there peculiar patterns or distributions? Officer selection processes and police practices should be examined. Evaluating particular departments/jurisdictions following a critical incident should constitute a 'lessons learned' for other locales AND a statewide or regional program modification. The interaction between police officers and citizens should be addressed contextually in terms of threat assessments in the organizational atmosphere of the police department and the jurisdiction/community of the units. There is research concerning the organizational pressure on the police officers that are in the field: the directives/mission/procedures, the chain of command, and the particular relationships between administrators and line officers, see Ronald Rufo, "Is Police Culture Killing our Officers?" 2016. Of special concern would be ethnographies that investigate whether interpersonal conflicts between employees in the judicial system, tout court, of a jurisdiction are mediated by administrators or whether there is indifference, or perhaps encouragement of competition! The implication might be that indifference by administrators to interpersonal conflicts between employees (not only between officers) contributes to a threat atmosphere that synergizes with the threat atmosphere on the street and during contact. The key idea I think is relevant is that threat is very subtle, not necessarily a physical interaction, and that management by threat is a typical bureaucratic and lifeworld ritual. The problem of implicit bias or attitude towards 'people,' towards 'officers,' is important. There has been quite a lot already written about racism/ prejudice/bigotry. Have there been organizational assessments or community assessments of this problem? How do we measure the degree of hostility, or "othering" that is occurring in a particular place/organization and have we attempted to modify these attitudes and practices. The perception of police presence, like the perception of a suspect, is highly variable. Are there recognized markers that establish probable cause for investigation? Does everyone recognize these markers? Are these markers common knowledge? I question this because my experience tells me that the markers of suspicion are not only subtle, but idiosyncratic. The marker that one person "thinks or believes" signifies a suspect is not agreed to by most others. This is most obvious when comparing officer's perceptions of criminal activity and citizen's perceptions! I think there is a problem of individual or self-authorization by anyone - those observing an officer, those observed by officers, or between any two persons - to characterize another as a perpetrator in some way, often without observable data. The question of 'threat' should complement the question of probable cause that motivated the officer to enact the contact. The question of role authorization is contested as an insult or degradation ritual when police encounter a person and label or treat them as a perpetrator. Interview data from Stop-and-Frisk suspects, from survivors of police shootings, and from officers themselves should be conducted to determine the psychological variables and the effective rules operative during these encounters. Knowledge and experience variables of both officers and suspects could be constructed. Statistically, there have been at least 3 times more whites killed by police than blacks but since the statistical reality indicates a disproportionate number of blacks, we are scrutinizing the problem. But, "justified police homicide" is just as much a conflict of interpretations over role authority (the un/armed criminal/suspect disregarding the official authorization of the officer) as it is a function of the directives, procedures and statutes which officers are following - whether or not these factors are given to or known by life-world inhabitants. And, whether or not these procedures are valid. To boil it down: we live in a period of time in our nation where disagreement and disrespect are endemic and ubiquitous in an everyday sense. The solution is a policy of communication where relationships are established through interaction and when the rules of appropriate interaction are spelled out that everyone knows what is expected. Ethnographies supplemented by statistical researches (Janet L. Lauritsen and Daniel L. Cork, eds., 2016, Modernizing Crime Statistics) should investigate organizational police practices, officer dispositions, and community behavioral patterns and practices. The presence of indifferent community leaders or Hate Groups should be identified through assessments of each jurisdiction. You people need to watch Colin Flaherty's YouTube channel Don't Make the Black Kids Angry. Daily TV news reports from around the country of black mob and black on everyone violence. Every. Day. On video. How can we take an objective look, and even more difficult, proactive action, without objective certainty regarding the existence, size, and locations of the issue? It is possible that, having a personal stake in this issue resulting from his experience of false police incrimination, in line with the narrative of the BLM movement, Rashawn may have absolute certainty in his views proclaiming widespread police discrimination as a result of emotional, rather than objective, judgment. It's quite clear Cody and Don came out firing objective arguments, and slowly but surely had their confidence widdled away by the unlistening rebuttals of their colleague. I'd hate to see scholarly rationality relinquished to cowardice upon arrival of the loudest, most passionate voice in the room. Oh look, a whole lot of baseless presumptions and declarations that don't match the data. This is why blacks should be hated. You guys left out some major points. The high majority of blacks shot by police are committing crimes, resisting , fleeing, or all of the above. Most importantly, don't be a criminal and your chances of staying alive are much greater no matter the color of your skin. I grew up in a black area. Black children are taught to steal and hate the police. That's just a fact I've witnessed hundreds of times. My goodness, what is seriously disturbing to me in these discussions is the lack of responsibility for humans. The UN would declare sanctions on the *"green community of the United States", if other Green people cared about each other to be upset by this. They don't. What race in this world is killing each other at an alarming rate of over 4,000+ lives per year??? The green people. Mostly male. They make up 6% of country population yet commit 44% of the murders. NOT ON ANYONE BUT THEMSELVES? WHO DOES THAT? Oh yeah the green community. Why??? Because the white person made them do THAT? *insert any color to point out the hypocrisy of your narrative. 36,000 lives in 8 years under our 'green President - killed each other!! Why? And WTF?? WHY DOES THAT NOT MATTER TO YOU?? Year after year, after Hope and Change?, after the richest green woman billionaire made herself in 25 years from only green people watching and supporting her? because the others who did are all racists? After green music artist mutli mutli millionaires, After the NFL who is 76% green, is made up of 81% white ticket owners, because they are all Racists? Green men kill each other for 'looked at me wrong', 'disrespected me', 'disrespected my ni$$! ', for what?? Yes, some bad cops. And not right. They are being addressed. But stop hurting the green community, keeping them down. The agenda to keep a race down by giving them free crap, no daddy's, no responsibility, no church, breaks their souls. Think they'll vote how you tell them? How did that work this time? How many of these police shootings were green cops shooting green people? Not in your data?? Is the solution no cops in green neighborhoods? Let em kill each other? Is the solution only green cops in green hoods? Is it reparations that will fix it all?? Then let's do it. Pay each green person $25k each. Done. We're all humans, we behave like respectful citizens. Clearly tearing down statues, violent protests, all that worked?? And having the first green president did nothing. The 'societal issue' is that all other races see that many green folk have risen above, accepted they are their own human beings and they can make choices. Good choices. And so have the many of immigrants come into this country from Sudan, Nigeria, Africa who make more than white median income in this country, fact. Fyi, they are green people too! They too came from slavery. No excuse for them? Their claim, "America is the land of the free and the home of the brave". Brave enough to work hard and you too can succeed. Just ask every other race who is not killing EACH OTHER at genocide levels. How many white women armed only with phones stopped by police get shot and *killed* by police each year? Hmmm? It bothers me that so many Black men being shot are armed only with Phones, and that Police feel that sufficient Extreme Force to kill them without firmly establishing "danger" is justifiable. But I am also weary of the bias displayed in over-dramatizing the role of Racism in police killings. "In fact, if we think about shootings, 75% of people who are shot actually survive. So there are a lot of people going around who have been shot by police officers." That is an irresponsible statement which a Sociologist *ought* to be able to spot as indicative of bias. First of all, the vast majority of people who police shoot - white or Black - are in deed armed and dangerous. Last year, only 16 were in fact "unarmed." In fact, very few of the thousands of Blacks shot each year are shot by cops.
" I think that is probably the reason why Whites, in the New York City study, were more likely to be found with something on them or committing a crime because the police officers were looking for other indicators besides their race that might actually suggest some type of criminality." "So if you are doing a DUI check in predominantly Black neighborhoods, even though Blacks are less likely to use drugs than Whites, then you are going to find more Blacks with drugs and you are going to end up convicting more Blacks." I don't really see the difference between Stop and Frisk programs and DUI Check programs. You seem to imply that you would expect to find "more Blacks with drugs..." So, why did the data not find more Blacks with drugs/contraband in the Stop and Frisk data? Is it because of the nature of the neighborhoods where Stop and Frisk versus DUI Checks are being made? I'm suggesting that you use the Stop and Frisk data to imply that Blacks are less likely to be engaging in criminal activities than whites - and that this suggests that Stop and Frisk programs are racist - when the data are likely to reflect statistical artifacts related to the reasons why police stop *white* people, which you have not diligently explored before decreeing Racism as the panacea explanation for all differences between Blacks and whites. Despite your title, I really don't feel that you have presented any sound statistical or logical reasons for ignoring the fact that Blacks commit far more crimes than whites on a per capita basis, and are therefore more "scary" and more likely to become involved in interactions with the police - over and above any element of racist motivations for stopping Blacks. 43% of shooting of Cops in the past decade were by Blacks. Why the heck shouldn't cops be more worried and fearful when they encounter Blacks? I am also disappointed that you are not more skeptical of the Implicit Bias theory and the severe shortcomings evident in the research which has been critical of it. There is sound research suggesting that Black cops are just as likely to shoot unarmed Blacks as white cops are, if not more so. There is also research that suggests that white cops are less likely to shoot Black suspects in both simulation studies and real data. I am also disappointed by your cherry-picking of yearly statistics, and by comments about differences being "significant" when I doubt you have actually done any statistical tests of significance. When you are talking about such small numbers of index (sample) cases versus the actual large population sizes, differences of a handful of actual people out of hundreds (or thousands) are not things to draw sweeping conclusions about. Similarly, your colleague citing no connection between levels of crime incidence and police shootings in ONE specific county is an insufficient reason to suggest that there is no connection in Nation wide data between Black criminality proportions and proportions of violent interactions with police. How can you possibly deny the relationship between criminality and the behavior of Alton Sterling, Mike Brown, Eric Garner and Keith Scott? And even Philando Castile? He was driving around smoking DOPE with a 5 year old child in the back seat. When he then states he has a gun, and appears to be reaching in a place where it might be located, who in their right mind would NOT be fearful? Furthermore, your comments about the cop mentioning his wide nose being racist are taking things out of context, as usual. The cop was trying to explain why he thought ONE occupant of the car might have resembled the picture and description of an armed and dangerous perpetrator of a recent robbery. It is distorted nonsense to claim that the only reason Castile was stopped was because of some racial animus against wide Negroid noses. One of your colleagues clearly stated that there was NO evidence of Racism among the vast majority of police in some data which he cited. Yet that does not stop some of you from suggesting that there is widespread racism among the police - even though you have to rely on a fabricated construct such as Implicit Bias to justify your comments. If you studied the Psychological literature, you would see how pitifully similar the Implied Bias concept is to Freudian Psychoanalytic concepts and techniques which were long ago debunked. Some of the Giants of Sociology (like Weber) warned against letting your personal biases creep into your research and sociological thinking. I don't think a lot of modern writers such as yourself pay enough attention to the reasons for such warnings. I don't think a lot of you *care*. Lastly, you decry the absence of good data sets. Yet, part of the reason is the fact that Political Correctness led Obama to order that certain data relating to race and crime should cease to be collected. Funny how we always hear the races reported when it is a white cop and a black victim, but other combinations are censored. The Academic world censors research which *might* show conclusions that might show Blacks and other minorities in a less than favorable light. The research either never gets approved, is not funded, or gets repressed by publishers. With regards to Sociology, Symbolic Interactionism and Conflict Theory have contributed greatly to the number of insights which can help us to understand the realities and illusions within which we live. Sadly, though, the influence of Marxism on modern sociological thought leads to many people being quite biased in the way that they apply their Sociological Imaginations, and it leads them to be unaware of their own contributions towards the promotion of Stereotypes towards people whom they do not like: especially white males. Thus, people are totally free to utter the most biased and derogatory comments towards white males, which would get them banned from social media if they made them with regards to any protected minority. The Dominant Ideology in contemporary Sociology (if not academia in general) precludes anybody from taking such comments by people like me seriously, even though I have been a Liberal for most of my life, and taught Sociology with a passion, not unlike yours, but not so publicly. It doesn't justify unarmed killings, but in how many of the cases of unarmed was there still a substantial threat?